Last month I warned you that we were entering this winter facing a very real chance of a spike in natural gas prices. 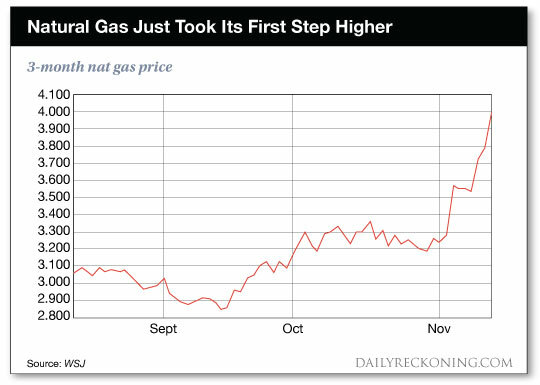 Here we are just a couple of weeks later and that natural gas price spike has already taken a pretty major first leg up. Since the start of November, the commodity has already skyrocketed 25 percent higher than when I wrote to you. That is a big move in such a short period of time, even for the notoriously volatile natural gas. You do not need to be an expert commodity trader to understand why natural gas traders were so excitable. The United States is entering this winter with an extremely low level of natural gas in storage — almost 20 percent below the trailing five year average. That is the lowest level in 15 years! And keep in mind that natural gas demand today is much higher than it was 15 years ago, so we need more in storage now than ever before. It is a precarious position for the market to be in heading into the winter. 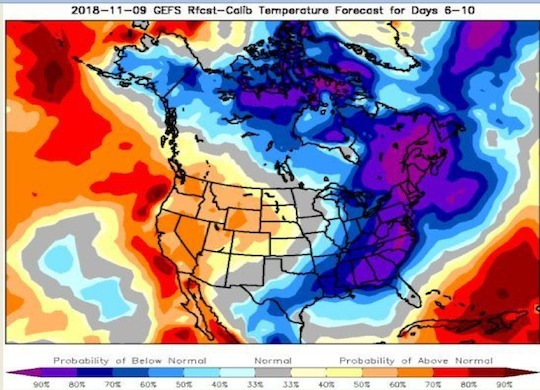 What triggered the big move in natural gas prices this month was a forecast for unusually cold weather in November. 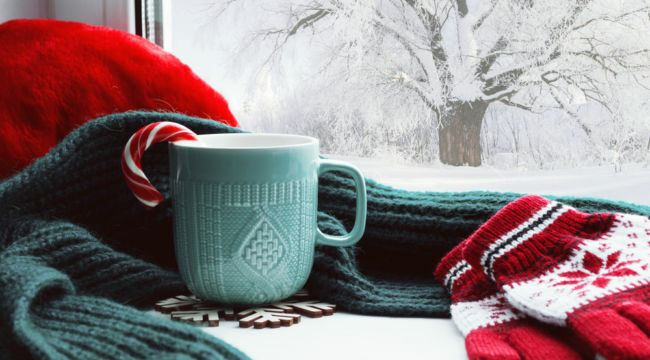 Cold weather means more natural gas will be used to heat homes which will pull the already low storage levels down even further. Look at all of that blue forecast for the entire East Coast calling for below normal temperatures! How High Could Natural Gas Prices Realistically Go? When I wrote you a couple of weeks ago about the potential for this natural gas spike, I worked through some numbers that showed how the commodity price could easily double. The truth is, there is potential for it to do much more than that. As I mentioned, the last time supplies were this low in the first week of November was in 2002. That winter the price of natural gas hit $12 per MMBTU which was a triple from where it was that fall! With prices today just edging up to $4 per MMBTU, we clearly haven’t scratched the surface on where the commodity could go if we get a cold winter. Last month I tagged Cabot Oil and Gas (COG) as a “win-win” way to play the potential spike in natural gas. I called Cabot a “win-win” because I believed that this stock is going higher whether natural gas spikes or not. A rise in natural gas prices would just make owning Cabot even better. I still love the stock even though the share price has quickly risen from $21 to almost $26 (just under 25 percent) since I initially wrote about it. The reason that I feel such love is that Cabot is about to let loose a flood of natural gas production. For years the company has been significantly restrained due to a lack of pipeline capacity in the Marcellus shale region. But those restraints have now been released! As of last month, the 200-mile Atlantic Sunrise Pipeline has gone into service. This pipeline will transport enough natural gas to meet the daily needs of more than 7 million American homes — almost 2 percent of U.S. natural gas production on a daily basis. By itself, Cabot will immediately fill almost half of that massive pipeline with its increased natural gas production! For Cabot, that means that production is going to immediately increase by 1 billion cubic feet per day. That is a 40 percent production surge for the company and it is happening just as natural gas prices spike. That is the short term for Cabot. The longer term is even better. This is a company that is going to be generating a lot of free cash flow in the coming quarters. Cabot’s biggest challenge is going to be deciding what to do with that cash, especially if natural gas prices continue moving higher. I have to say that I like the sounds of that! And I’m sure Cabot’s shareholders do too.